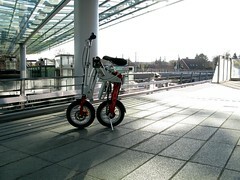 After all the talk of the very excellent Brompton, I realised that I'd never written about my own folding bike. As fate would have it, I ended up with the Mobiky Genius. I don't use it that much here in Copenhagen but it's nice to have. A French design that has won the prestigious Red Dot Design Award in 2007, the bicycle is a treat when considering folding ability, riding experience and storage. Plus, I love the aesthetic look of the bike. 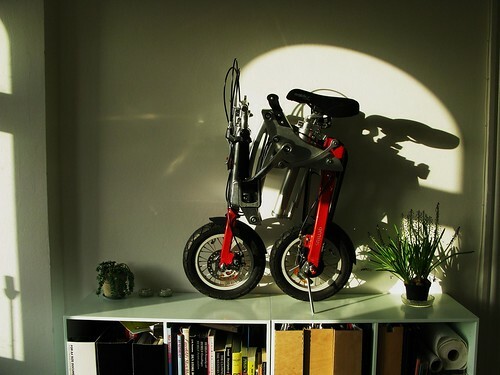 It is a fine example of Bicycles As Interior Design Objects. Not that it's in the flat all the time. That would be geeky. It's in the cellar. I only use it for two reasons. The first is fetching a car from the car share programme we subscribe to. As a rule there are cars at the spots around the corner but if it's busy and I have to travel a bit farther to pick up a car, I'll take the Mobiky. I have also taken it on trips to other European cities on business. Berlin was a breeze. 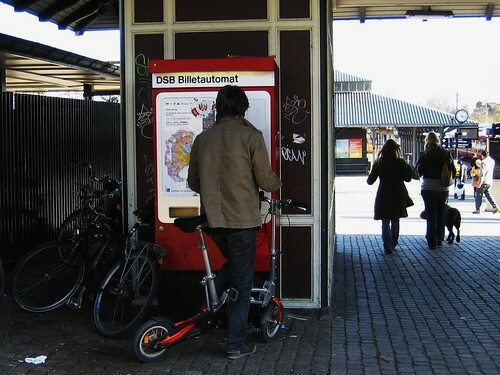 Bus from Tegel airport to Zoo Station and then hop onto the bike for the rest of the day. It only weighs 13.5 kg so into the bag with it and check it in for the flight. We've taken it out for bike rides and it's great that both me, Wifealiciousness and the boy Felix can use it. Felix can unfold it in 25 seconds. We timed it. Boys like stuff like that. Despite the small tyres, it rides completely and utterly like any other bicycle. There are two chains to assist this function. I like the detail that you can fold it up and leave the handlebars up so you can just roll it along with ease if you need to, instead of having to carry it all the time. 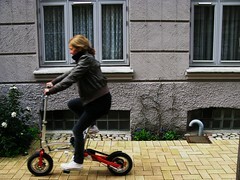 Here's a film from Mobiky about the bicycle in use in the urban environment. To be honest, the Mobiky Genius is the only folding bike that I've seen that can compete with the Brompton for elegance, aesthetic design and comfortable riding.